There was some amazing shooting at a recent Invitational Heavy Benchrest match* held in Visalia, California on October 21-22, 2017. No less than FOUR new Heavy Benchrest (HB) records may have been set. Three individual targets were submitted for the 100-yard HB five-shot group record, a .039 by Gary Ocock (photo below), along with two targets by Jim Nicolas, a .040 and .041. Multiple Aggregate records (at both 100 and 200 yards) may also have been set. Larry Boers shot a 100-yard, five-target 0.1232 Aggregate that will be submitted for the IBS HB 100-yard, five-shot group Agg record. And Gary Ocock may have set two additional HB Agg records. Gary’s five-target 200-yard Agg (0.1310) is a potential new five-shot-per-target record, as is his ten-target Grand Agg (0.1480) (that covers 100 AND 200 yards, five targets per yardage, ten targets total). This California match attracted some of the best Railgun pilots in the game today. On the firing line were three current NBRSA Unlimited record holders: Larry Boers (one record), Steve Kostanich (two records), and Gary Ocock (three current NBRSA UNL records, plus one HV). All three shot well enough in this match that their targets are being submitted to the IBS for consideration as Group, Aggregate, or Grand Aggregate records. NOTE: The “Heavy Benchrest” IBS category is equivalent to “Unlimited” under NBRSA rules. CLICK HERE for Complete Match Results. 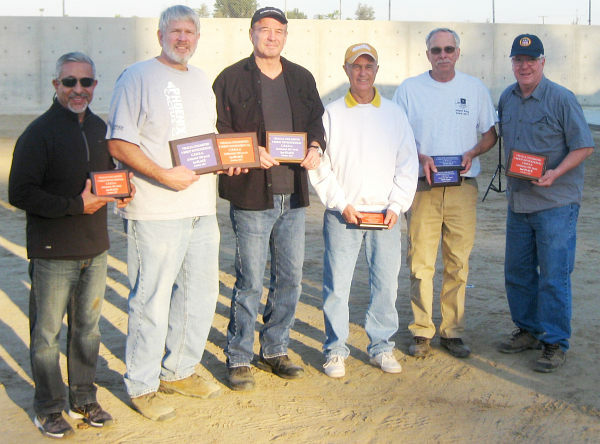 Top Shooters for the Match included: Larry Boers (Two Gun, HB GrAgg1, HB 100-yd); Gary Ocock (HB 200-yd and HB GrAgg2); Francis Lee (HB 200-yd). Note: The computer software shows the results for one Grand Agg as “Heavy Varmint”. In fact the SAME HB Railguns were used for both Grand Aggs, so the “Two-Gun Agg” is actually a pair of HB Aggs. Saturday Winners: George Lozano, Larry Boers, Lawrence Weisdorn, Gary Ocock, Joe Stanovich, and Jim Nicolas. Photo by: Dan Lutke. Conditions: It rained on Friday, but Saturday and Sunday were sunny and slightly cool at first and perfect after that. Saturday at 10:00 am it was 62°, 64%, and the wind was light, increasing slightly later in the day. Sunday’s conditions were similar with a slightly higher wind speed, but still light. The wind was from the West at 3-10 mph, generally stronger closer to the firing line than down range. This normally is more of a picker’s range than a runner’s venue. However, there was some “running” of groups this weekend since rail guns are particularly suited for that style of shooting. Along with the seasoned veterans, there was a new competitor, a 12-year-old shooting his very first match. As with life, there were highs and lows. Young Gavin started out with an equipment failure — the rifle he brought wasn’t working, so shooter Bob Hatley let Gavin borrow Bob’s bag gun. Then Gavin got some expert assistance from one of the world’s best — Hall of Famer Gary Ocock. 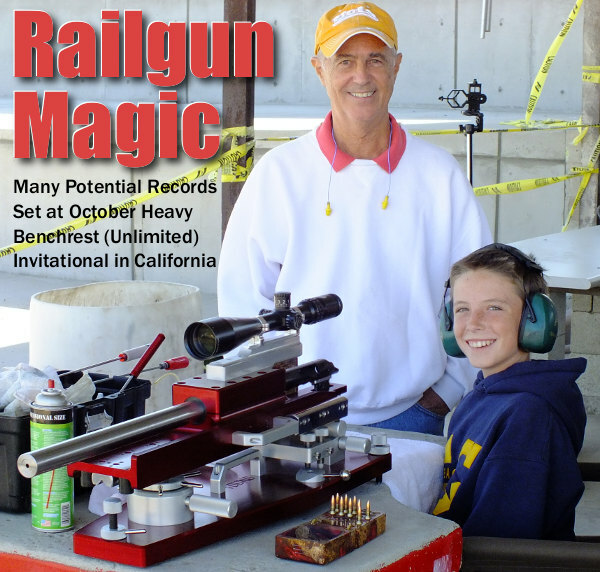 Gary let Gavin shoot the last three 200-yard matches with Gary’s new integral block, Jay Young-built Railgun, one of the most accurate firearms on the planet. Gary shot this rig on relay #1 and let Gavin shoot it in relay #2. How many of us will ever get this kind of opportunity, much less a first time 12-year-old competitor? It’s like a school kid getting to drive an Indy-winning race car. 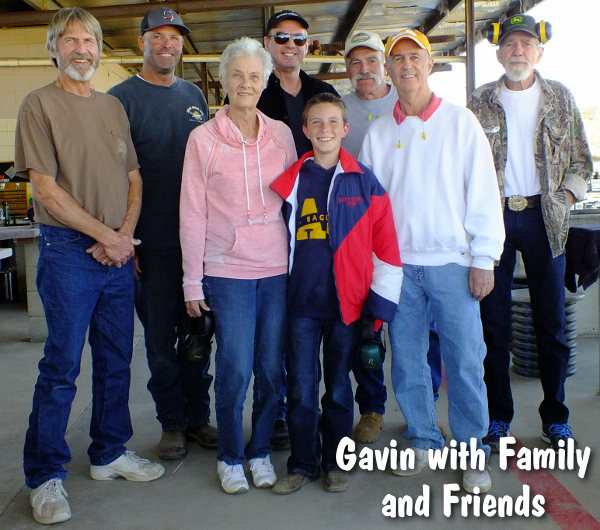 This photo shows Gavin with family and friends: Grandmother Mary Oulrey, father Mark Lichtenwalter (second from left), grandfather Gary Oulrey (far right). Bob Hatley (extreme left) stepped up to share his bag rifle with Gavin, and Gary Ocock (right of Gavin) let Gavin shoot his Railgun. Note Gavin is wearing Gary’s Hall-of-Fame jacket. 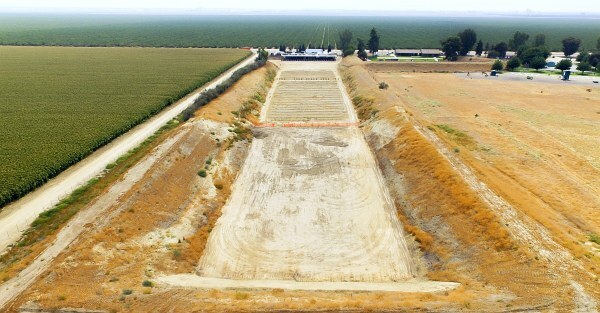 The Visalia Range has a covered firing line with 28 fixed, monolithic steel-reinforced concrete benches. The direction of fire is north. The cover extends well past the front of the benches as does the concrete. There are covered loading areas both at the level of the benches, directly behind them, and one level up farther to the rear. The firing line and range are below the level of the surrounding land, having been excavated in flat ground with the material from the excavation surrounding the range on three sides, higher in the back, forming an impact berm. A major construction project is about to be finished that will extend the range to 300 yards, and provide a new 10-station, 25-yard pistol range. Three of the competitors at the match deserve special mention because of their recent accomplishments in the world of Benchrest shooting and the interesting equipment they had on display. Jim Nicholas was on fire on Saturday. During Saturday morning’s 100-yard Aggregate he shot a .040 in the fourth match, and a .041 in the fifth. 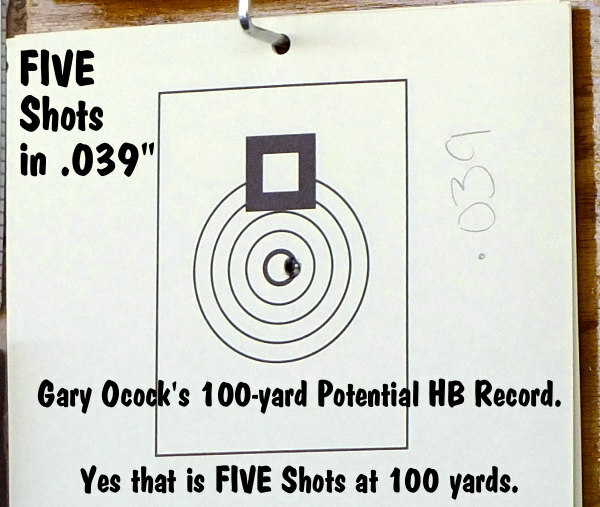 Both targets and the .039 that Gary Ocock shot were sent in to be measured for a record. All are substantially smaller than the current record, Hap Zeiser’s .063. In the photo above, note the tuner. Jim adjusted a little less than 8 degrees just before he shot .040 in the fourth match and .041 in the fifth. That must have been the “sweet spot”. 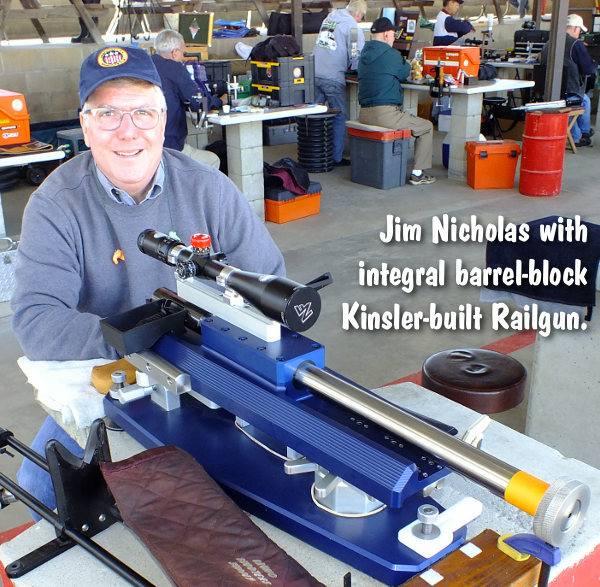 Jim’s blue Railgun, built by Craig Kinsler, features a barrel block that is integral with the rig top. This is like the new Jay Young Railgun Ocock shoots. Larry Boers owns the NBRSA Unlimited, 100-yard 10-shot group record (.097). This makes the fourth time that he has won the Two-Gun Overall for this match. 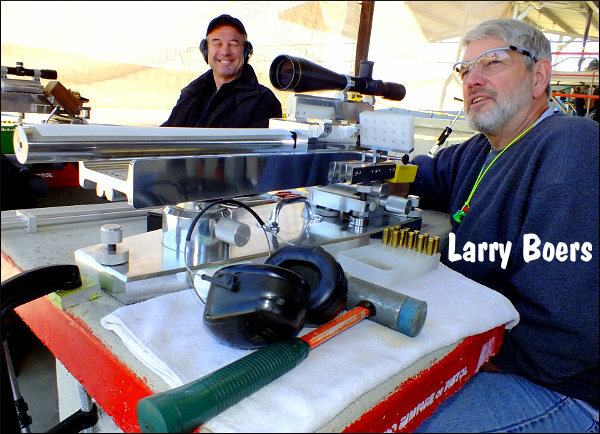 Larry is not just a trigger-puller — he makes his own bullets and chambers his own barrels. This year he shot a bullet he still lists under his bullet-making mentor’s name (Del Bishop) a 65 grain, double radius 5/9 FB made from J4 .790 jackets, out of a Nemi point die. Del originally made the bullet and the story is that Nemi at first refused to make the die because he was sure that it wouldn’t shoot well. Later, after some cajoling by Del, he made it, tried a few and excitedly called Dell to tell him just how good the bullets shot. Larry set his record shooting a .750 jacket short BT (.040) bullet from the same die. 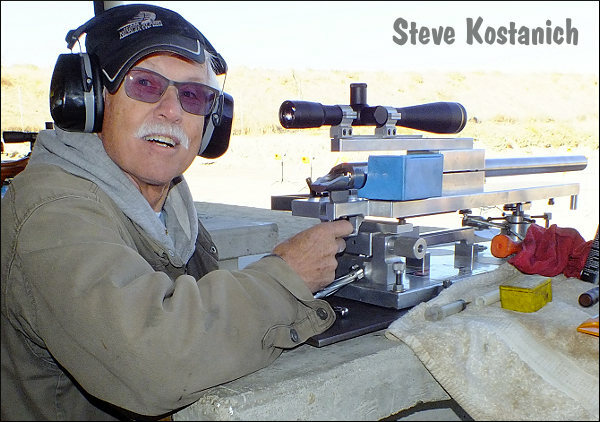 Steve Kostanich, a long-time competitor and highly-respected gunsmith from Washington State, recently received official confirmation that he will go in the record books with a pair of 10-shot Unlimited NBRSA world records. The first record is a 10-shot 200-yard 0.1839 Aggregate, while the second is Steve’s 100-200 yard 0.1951 Grand Aggregate. 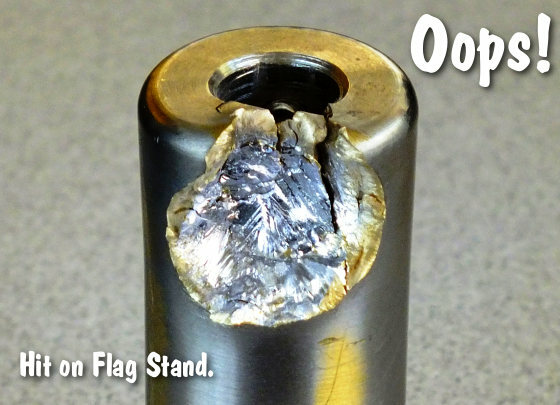 Parting Shot — This is what happens when you set your Wind Flag stand too high. * Course of Fire: This was a two-day Heavy Benchrest (aka HB or “Unlimited”) weekend match with targets at 100 and 200 yards, five shots per target. Saturday all shooting was at 100 yards. Sunday all shooting was at 200 yards. There were two (2) Grand Aggregates. One Grand Agg combined Saturday morning (100) with Sunday afternoon (200). The Second Grand Agg combined Saturday afternoon (100) and Sunday morning (200). The match had two HB Grand Aggs because only one class of gun (Heavy Benchrest or “Unlimited”) was shot. The computer software shows the results for one Grand Agg as “Heavy Varmint”, but all matches were for Heavy Benchrest (Unlimited) guns. NOTE: Some competitors did shoot bag guns as these are allowed under HB/Unlimited rules.